Glogirly and that other guy FINALLY returned from their vacation. You know, the vacation they took without me. The vacation they took while abandoning me. The vacation they took while leaving me in the care of some stranger. 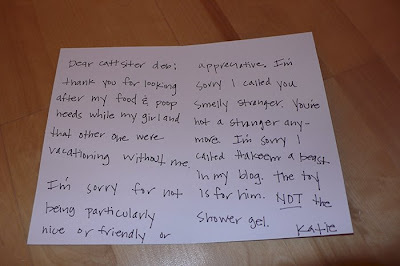 While they were gone, Glogirly had the audacity to send me little notes on my blog, telling me to be nice to the cat sitter. The nerve. 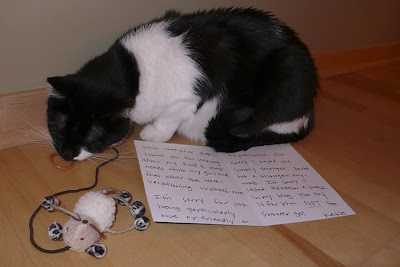 And to top it off, as soon as she got home she made me write a thank you note to the cat sitter. She even made me give the cat sitter AND the cat sitter's cat a present. 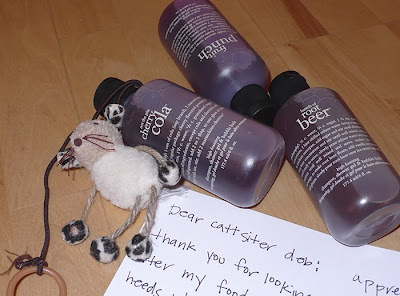 Flavored shower gel for the cat sitter and a toy for her cat. Glogirly insisted the thank you note be hand-written. Quite a challenge considering I have no thumbs. My paws are still all cramped up from the experience. The following note was indeed written by me, however the words are not necessarily representative of my own feelings. I was under duress. Thank you for looking after my food & poop needs while my girl and that other one were vacationing without me. I'm sorry for not being particularly nice or friendly or appreciative. I'm sorry I called you a smelly stranger. You'r not a stranger anymore. I'm sorry I called Hakeem (her cat) a beast in my blog. The toy is for him. NOT the shower gel. Oh my god, I'm laughing out loud! I feel bad that Katie had to do this, but I really appreciate it nonetheless! I love everything!! And Hakeem is really enjoying his cute new toy!! Thanks!! Gloman thought you'd keep the cat toy for yourself and never tell Hakeem what he was missing! Thanks again...you're the best.